Pavol Breslik has released a welcome recital of eleven Mozart tenor arias taken from five operas Idomeneo, Don Giovanni, Così fan tutte, Die Entführung aus dem Serail and Die Zauberflöte including a single concert aria K.431 (425b). Clearly Mozart is an integral part of Breslik’s career, since he has sung all six roles on this album except the title role in Idomeneo. On one of the arias from Die Zauberflöte Bresli is joined by José van Dam who takes the role as the speaker (Old Priest). Born in 1979 Slovakian tenor Breslik studied at Bratislava Conservatory of Music and Opera Studio CNIPAL, Marseilles. Aged twenty-one he made his professional debut as Don Ottavio (Don Giovanni) in 2000 at Prague and was an ensemble member of Berlin State Opera in the period 2003-06. After being chosen as the 2005 ‘Most Promising Singer of the Year’ by Opernwelt magazine Breslik embarked on his international career and has performed in a number of world famous opera houses. A few years ago one of my ‘Recordings of the Month’ included Breslik’s splendid Tamino in Robert Carsen’s Die Zauberflöte at the 2013 Baden-Baden Easter Festival under Sir Simon Rattle on a Berliner Philharmoniker Blu-ray (review). Breslik sings most engagingly throughout this collection displaying his attractive bright, ringing tone and ease of projection. His coloratura passages couldn’t be described as gleaming or effortless, but nevertheless they are realised capably. My highlights include from Don Giovanni, Don Ottavio’s extremely lyrical act one aria ‘Dalla sua pace’ which fits Breslik’s voice eminently, communicating considerable reflection and fondness as he expresses his love for Donna Anna. In the act two aria ‘Il mio tesoro intanto’ Breslik is smooth and assured as he vows with highly charged expression that Donna Anna will get her revenge on Don Giovanni. The character Belmonte from Die Entführung aus dem Serail has four excellent arias and is a role that undoubtedly suits Breslik. From act one in Belmonte’s love song ‘Konstanze, ‘dich wiederzusehen’ the tenor rapturously reveals his heart beating wildly in anticipation of meeting Konstanze. Belmonte’s act three aria ‘Ich baue ganz auf deine Stärke’, challenging for a tenor owing to its wide range, is rendered with a real sense of sincerity proclaiming that his love for Konstanze gives him strength. Another high point is Tamino’s enchanting portrait aria ‘Dies Bildnis ist bezaubernd schön’ from Die Zauberflöte sung beautifully by Breslik with captivating joy and warmth. In the title role from Idomeneo, and rather less successful, is the act one aria ‘Non ho colpa’ where Breslik provides a distinctly pale rendition. From Die Zauberflöte in his role of the old priest known as the Speaker I enjoyed the dark, clear tones of veteran bass-baritone José van Dam accompanying Breslik in the aria ‘Die Weisheitslehre dieser Knaben’. The final work on the album, the substantial concert aria Misero! O sogno - Aura che intorni spiri, K.431, is sung by Breslik with intense feeling demonstrating his technical and artistic aptitude. With judicious speeds, Patrick Lange conducts the Münchner Rundfunkorchester and proves to be an understanding partner providing stylish and alert playing. Recorded at Studio 1, Bayerischer Rundfunk at Munich the sound quality is satisfactory being reasonably clear with a good balance between singer and orchestra. In the booklet full sung texts are provided and with English translations too except for the final track, the concert aria K.431 (425b). Also included is a helpful essay written by Klaus Kalchschmid. My minor grumble is the relatively short playing time of just under fifty-six minutes. Certainly, two or three additional arias would have been most welcome. 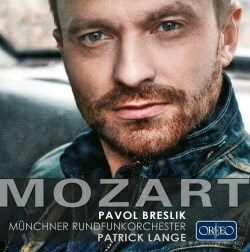 This is a most desirable collection that impressively reveals Pavol Breslik as an insightful Mozartian of note.